Cardiff's 4 - 1 defeat at Anfield kept the side out of the bottom three after big losses for Fulham and Huddersfield and a goalless draw for Newcastle. The hosts were dominant from the off, with Mohamed Salah giving them a ninth-minute lead with his fourth goal for Liverpool in his last three appearances in all competitions. Cardiff survived a siege on their goal in the first half before taking the attack to Liverpool in the second, but Mane's 66th-minute strike seemingly ended any hope of a comeback for the visitors. Bluebirds boss Neil Warnock had warned his side faced an "impossible job" but Callum Paterson deservedly got them back in it with 13 minutes to go - the first goal Liverpool have conceded in the Premier League at Anfield since February. Instead, late goals from substitute Xherdan Shaqiri (84) and Mane (87) sealed a win to send Liverpool - unbeaten in the league this season - top, until Manchester City face Tottenham on Monday Night Football at least. Liverpool flew out of the blocks and put Cardiff under pressure right from the off, taking the lead with just nine minutes on the clock. Mane's initial effort from just inside the box was charged down, Georginio Wijnaldum was then also denied by a fine block, but Salah was on hand to slot home from the tight angle to net his 51st goal for Liverpool. Cardiff - who stay 17th in the table - were at sixes and sevens as they struggled to cope with Liverpool at their relentless best. Virgil van Dijk almost added an immediate second, but his header came out off the post, before Salah was denied by Cardiff goalkeeper Neil Etheridge on the slide outside his box. The only downside to Liverpool's play was that they were trying to be overly intricate in the final third, with Cardiff just about hanging on. Adam Lallana did almost net that second on the stroke of half-time, but saw his header cleared off the line by Cardiff captain Sean Morrison. 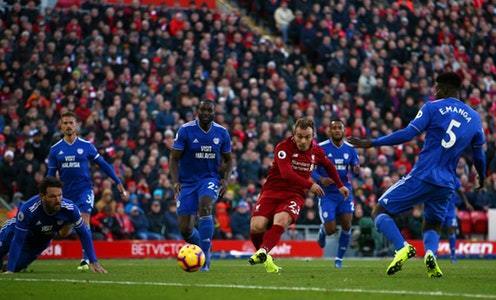 Cardiff came out for the second half with added impetus, but could not create that killer opening, and their lack of potency was punished when Mane made space for the shot himself, before firing an unstoppable strike into the net from the edge of the box to double Liverpool's advantage. Liverpool took their foot off the gas after Mane's goal, which allowed Cardiff to get themselves back in it through Paterson. Junior Hoilett's low cross was deflected closer to Allison's goal by Van Dijk, Paterson stole a march, before prodding the ball home. Liverpool had gone 918 Premier League minutes without conceding at Anfield. It was not long, though, before Liverpool made sure of the victory with Shaqiri - who made a huge difference after coming off the bench - finishing off his first goal for Liverpool smartly after being picked out by Salah in the box. Salah then provided a sumptuous pass for Mane, who raced through before lofting the ball over Etheridge to put the icing on the cake with his 50th Premier League goal. Liverpool have won 26 points in their opening 10 Premier League games this season (W8 D2 L0), their joint-best start to a Premier League season (also 26 in 2008-09). Since the start of last season, Liverpool's Mohamed Salah has been involved in 33 goals in 24 Premier League appearances at Anfield (23 goals, 10 assists). Cardiff completed 120 passes in this match - just nine more than Liverpool midfielder Georginio Wijnaldum managed during the game (111). Mohamed Salah has scored 33 goals in 35 matches at Anfield for Liverpool in all competitions. Liverpool: Alisson, Alexander-Arnold, Lovren, Van Dijk, Moreno, Fabinho, Wijnaldum, Lallana (Shaqiri, 61), Mane, Salah, Firmino (Milner, 71). Subs not used: Mignolet, Gomez, Matip, Robertson, Sturridge. Cardiff: Etheridge, Manga, Morrison, Bamba, Bennett, Gunnarsson (Damour, 73), Camarasa, Murphy (K.Harris, 74), Reid (Zohore, 86), Hoilett, Paterson. Subs not used: Smithies, Connolly, Cunningham, Madine.